The city’s sushi masters are on a roll: Whether you’re craving a melt-in-your-mouth morsel of traditionally prepared maguro or over-the-top fusion fun, you’ll find it here. By Jacqueline Cain·	 9/18/2016, 6:00 a.m.
Angling for a peek inside the city’s buzziest new high-rise? Just drop by the Boston outpost of San Francisco sushi bar Pabu, which opens November 1 in the Millennium Tower. A joint venture from James Beard Award–winning chef Michael Mina and chef Ken Tominaga, the izakaya strives to be both contemporary and very Japanese, serving elegant, uncomplicated bites with pristine ingredients. “People eating shrimp have to taste shrimp. Tuna tastes like tuna,” Tokyo native Tominaga says. Case in point: the chef’s namesake (1) Ken’s Roll, with shrimp tempura and spicy tuna. To update its menu for Boston, Pabu will swap San Fran–sourced ingredients for local seasonal delicacies—like Boston bigeye tuna in the marinated (2) maguro-zuke. 3 Franklin St., Boston, michaelmina.net. The sashimi bar Ken Oringer opened below the Eliot Hotel 14 years ago was never intended to be a paragon of Japanese technique—just a playful nod to it. When he and partner Tony Messina expanded Uni into a full-blown sushi stronghold earlier this year, they doubled down on that nontraditional approach. That translates to riffs on sushi standards, such as this (3) egg nigiri made with deviled nitamago (ramen egg)—as well as tongue-in-cheek creations like the (4) White Castle makimono. New Jersey native Oringer first made this stoner-friendly roll as an off-menu item for friends in the days of “lower” Uni. Now anyone can order the sushi-fied slider, jacked up with cheddar and a sprinkle of house-fried potato sticks. When it comes to sushi, restaurateur Tim Cushman has one rule: “Anything goes, but it has to work with the rice.” With that directive in mind, O Ya chef Nathan Gould is innovating with vegetarian options like this (5) carrot gunkan maki, which substitutes spheres of bright carrot juice for the traditional salmon roe. Over in the Fenway, Cushman’s freewheeling izakaya Hojoko cuts loose with more irreverent fare. Take the wasabi roulette—a platter of identical-looking nigiri, with one piece hiding a blast of the brassica—or this (6) spicy salmon roll, a smoky twist on the classic laced with mayo laden with roasted Oaxacan pasilla chilies. O Ya, 9 East St., Boston, 617-654-9900, o-ya.restaurant; Hojoko, 1271 Boylston St., Boston, 617-670-0507, hojokoboston.com. When Seizi Imura took over his parents’ sushi bar in 2007, he got a by-the-numbers restaurant that was busiest on dollar sushi night. 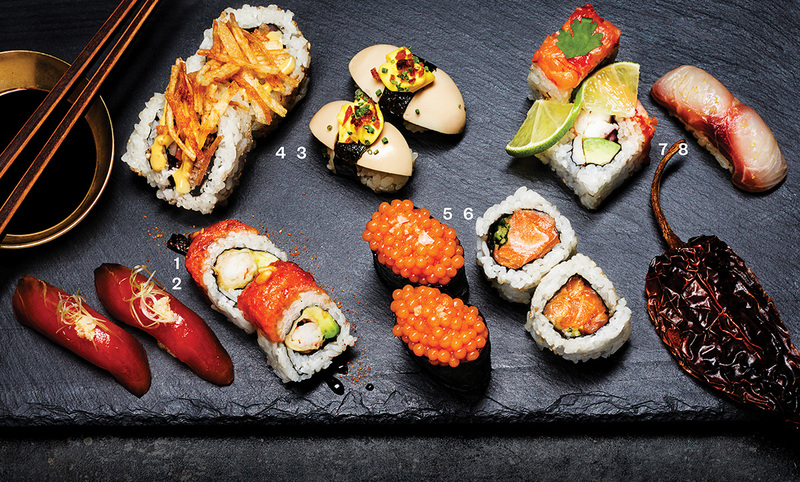 But riding a wave of creativity after an eight-year culinary career in California, Imura set out to move Café Sushi beyond the combo plate. Some of those first creations, such as this (7) ceviche maki—featuring cilantro, tomatoes, and lime juice—are still on the menu. Lately, though, Imura is focusing on the fish itself, diligently sourcing local and Japanese seafood such as this (8) isaki, a sliver of delicate whitefish seasoned with Sicilian olive oil, Appalachian salt, and lemon zest. Next, Imura plans to expand Café Sushi into an adjacent storefront with a bigger bar—for both sushi and sake. 1105 Massachusetts Ave., Cambridge, 617-492-0434, cafesushicambridge.com.